A large, popular state-run beach with a boat launch. 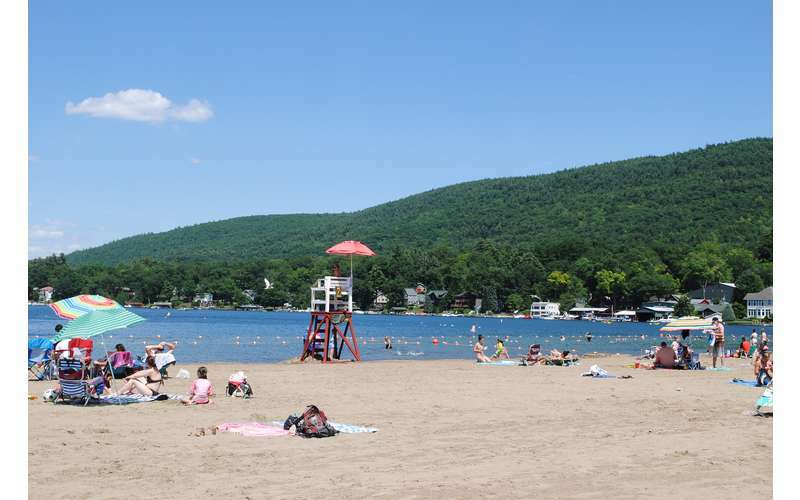 Lake George (Million Dollar) Beach is a popular area beach with lifeguards, showers, picnic areas with grills, lots of room to swim, and parking for 200 cars. It also features a state-run, public boat launch with a boat inspection station. 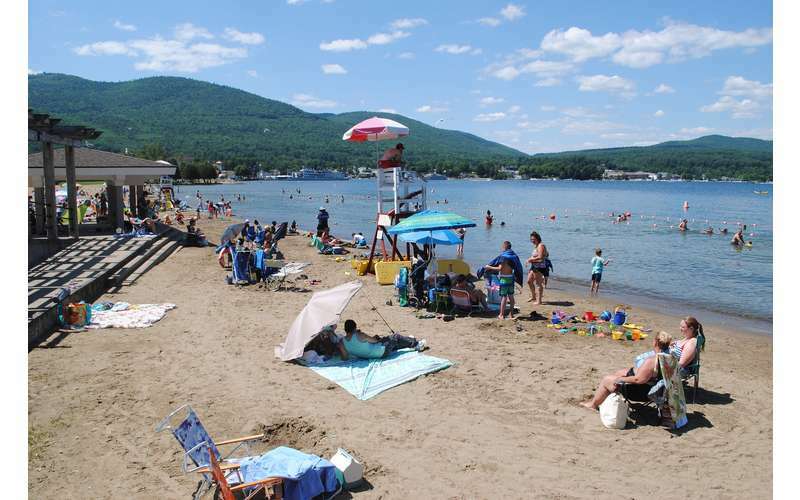 Million Dollar Beach is the largest and most popular beach in Lake George Village. It is state-run, clean, and family friendly. The beach features picnicking, swimming, a volleyball court, showers and changing rooms, and lifeguards on duty. The picnic tables and grills by the beach are available on a first come first served basis. There is also a public boat launch which includes a boat inspection/boat wash station, to prevent the spread of invasive species. 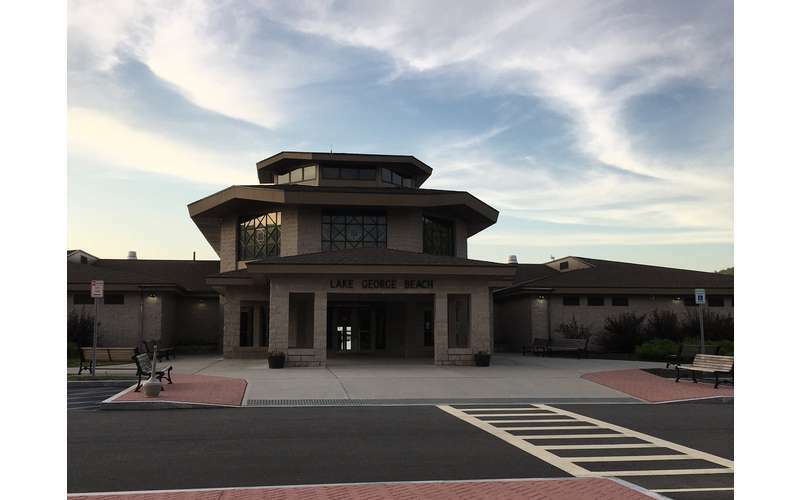 From May 25 through September 2, 2019, the public will have access to the beach from 8:00am-8:00pm daily to relax, picnic, and hang out on the sand. You may only swim if lifeguards are on duty. Use of the beach and public picnic area are free. Parking costs $10/car, $5/motorcycle, and $50/bus. The boat launch adjacent to the beach area opens at 6:00am and there are 30 designated parking spaces (plus two accessible spaces) for the launch. Due to the popularity of the spot, these spaces fill up quickly. At Million Dollar Beach, a public boat inspection station, boat washing station, and boat launch are located adjacent to the beach area. The boat launch opens at 6:00am and is available for use throughout the boating season from ice out to ice formation. Boat inspections and boat washing are free of charge. Beautiful facility. Conservation folks that wash your boat are great and helpful. However, I do not recommend. Be aware - the male individual who was “in charge” of the boat launch area on Monday, September 3, 2018 is an extremely angry, unhelpful and just plain mean individual. The review posted on July 4th is accurate. We spent a wonderful time Labor Day weekend in the village - stayed on Marine Village on the lake - great place. Had no problem launching when arrived because we were not leaving boat and trailer at boat launch - the hotel had space for it. When we went to retrieve the boat Monday morning and pulled up the male in question angrily stated “we are full”. We were confused and did not understand - the parking lot was EMPTY. Tons of space and we would only be there long enough to walk back to the hotel and retrieve the boat - maybe 30 minutes with a quick walk. There was plenty of room - boat & trailer spots were not full (he had red cones in some, saving them for others. AND the parking lot had a large pickup with large RV trailer parked on one side and again EMPTY. We attempted to explain we just needed to retrieve the boat quickly. He yelled at us again “I said we are full”. We asked if could help us with any alternatives because we were confused but open minded to options - he literally threw a piece of paper in our truck window and yelled angrily “I said we were full”. We said have a nice day and drove over to the friendly gentlemen that wash your boats. He followed with his golf cart and they wouldn’t speak to us and simply said - sorry he’s in charge, you have to talk to him and mentioned other marinas but none are in walking distance to the hotel so not an option. So - we left, paid for meter parking in 3 spots a short walk up the street on a side road (again - EMPTY), walked to the hotel and brought the boat to the dock. I stayed with the boat while my husband retrieved the truck since it was the parking lot in question. Same angry man in question came down the dock and asked what I was doing. I stated my husband is bringing the truck around now, we parked it up the street. There was another dock open so we were not holding things up. He told me I had to move the boat and started yelling at me when I refused. I said I was not doing that. He came back with 3 men from another boat and said they would help me move it. I again politely said no, no one is going to get on or move my boat, he’s coming with the truck now (I could see it - It’s bright red) He was at the booth and the lady stated to him that her “husband” (angry man) was not happy because I wouldn’t move the boat and there is no room for us to retrieve and he called the sheriff (again - plenty of room) He pulled the truck down into the water to retrieve the boat and angry man started yelling at us again. We retrieved the boat, went to the washing station and left without incident because we were not going to let a power hungry angry man ruin our vacation. We were so totally confused. We’ve been enjoying lake George for a long while ...but going to Bolton Landing from now on instead of the village. It’s totally crazy - should be much better run - it is a tourist town- so be aware and enter at your own risk - or save yourself the hassle - go to Bolton Landing, use another launch site or go to a marina. A nice beach, but, the rules are rediculous. No floaties, no water wings, no under water swimming or water toys, no game playing. Also, I will call her the Beach Nazi was yelling at people for walking in the water outside of the swimming area and literally called security on a man and his daughter for walking in the water. The Lake George state boat launch is being used as a boat parking lot , not truck and trailer as it’s intended use. Today July 4th I pulled in at 6:30 am and every spot had a boat sitting in every spot and in two of the 30 spots were single jet skies parked taking up truck and trailer spots. This is supposed to be a boat launch , not boat parking until it’s convienemt for whome ever. This has been an on going problem, it’s also a problem every weekend. If you pull into the launch you should have to launch your boat hence boat launch not boat storage/parking. There is very limited parkimg , only 30 spots so this problem needs to be addressed ASAP , it’s not fair for the people who pay for this privilege then can’t use the launch due to this problem . Please help! everyone feels the same way but no one is doing anything about it. If your not the right contact please direct me to someone that can help thanks. Went 2 weeks ago, someone should take the edge of the beach. But, great time, great weather. Going back this July 1 weekend. Nice average beach. Facilities are clean and snack bar good. What a great place to burn picnic tables and make new friends all this because the water can not be swim in this million dollar sess_pool. The only eye catching thing her are the changing of the leaves and I am wondering if they are even real. Save your money go some where outside of anew York State Please!